This article is about the device. For other uses, see Booby trap (disambiguation). A booby trap is a device or setup that is intended to kill, harm, or surprise a person or animal, unknowingly triggered by the presence or actions of the victim. As the word trap implies, they sometimes have some form of bait designed to lure the victim towards it. At other times, the trap is set to act upon trespassers that violate personal or restricted areas. The device can be triggered when the victim performs some type of everyday action, e.g., opening a door, picking something up, or switching something on. They can also be triggered by vehicles driving along a road, as in the case of victim-operated improvised explosive devices (IEDs). Booby traps should not be confused with mantraps which are designed to catch a person. Lethal booby traps are often used in warfare, particularly guerrilla warfare, and traps designed to cause injury or pain are also sometimes used by criminals wanting to protect drugs or other illicit property, and by some owners of legal property who wish to protect it from theft. Booby traps which merely cause discomfort or embarrassment are a popular form of practical joke. The Spanish word bobo translates to "stupid, daft, naïve, simple, fool, idiot, clown, funny man, one who is easily cheated" and similar pejorative terms. The slang of bobo, bubie, translates to "dunce". Variations of this word exist in other languages (such as Latin), with their meaning being "to stammer". Thus, the term "booby trap" gives rise to the idea that an individual with the misfortune to be caught in the trap does so because the individual is a "booby", or that an individual who is caught in the trap thereby becomes a "booby". The word has also been applied to the sea bird genus Sula, with their common name being boobies. These birds, adapted for sea flight and swimming, have large flat feet and wide wingspans, making it difficult for them to run or take flight quickly. As a result, they are considered clumsy and easy to catch when onshore. They are also known for landing aboard seagoing vessels, whereupon they have been eaten by the crew. In approximately 1590, the word began appearing in the English language as booby, meaning "stupid person, slow bird". The phrase booby trap originally applied to schoolboy pranks, but took on its more sinister connotation during World War I. A group of 105mm artillery shells with plastic explosive stuffed into their fuze pockets. Each of the 5 shells has been linked together with red detcord to make them detonate simultaneously. To turn this assembly into a booby trap, the final step would be to connect an M142 firing device to the detcord and hide everything under some form of cover e.g. newspapers or a bed-sheet. Boobytrap firing devices, c. 1941: Press, pull and release switches; mass-produced components intended for the construction of booby traps. A military booby trap may be designed to kill or injure a person who activates its trigger, or employed to reveal the location of an enemy by setting off a signalling device. Most, but not all, military booby traps involve explosives. There is no clear division between a booby trap and buried conventional land mines triggered by a tripwire or directional mine. Other, similar devices include spring-guns and mechanisms such as the SM-70 directional antipersonnel mine. What distinguishes a booby trap is that its activation is intended to be unexpected to its victim. Thus booby trap design is widely varied, with traps or their trigger mechanisms often hidden. Frequently at least part of the device is improvised from standard ordnance, such as an artillery shell, grenade, or high explosive. However, some mines have features specifically designed for incorporation into booby traps and armies have been equipped with a variety of mass-produced triggering mechanisms intended to be employed in booby traps deployment. Part of the skill in placing booby traps lies in exploiting natural human behaviors such as habit, self-preservation, curiosity or acquisitiveness. A common trick is to provide victims with a simple solution to a problem, for example, leaving only one door open in an otherwise secure building, thereby luring them straight toward the firing mechanism. An example that exploits an instinct for self-preservation was used in the Vietnam War. Spikes known as Punji sticks were hidden in grassy areas. When fired upon soldiers instinctively sought to take cover by throwing themselves down on the ground, impaling themselves on the spikes. Attractive or interesting objects are frequently used as bait. For example, troops could leave behind empty beer bottles and a sealed wooden packing case with "Scotch Whisky" marked on it before leaving an area. The rubble-filled packing case might be resting on top of an M5 or M142 firing device, connected to some blocks of TNT or to some C4 explosive stuffed into the empty fuze pocket of a mortar shell. Alternatively, the weight of the packing case might simply be holding down the arming lever of an RGD-5 grenade with a zero-delay fuze fitted and the pin removed. Either way, when the case is moved; the booby trap detonates, killing or severely injuring anyone in the immediate area. Many different types of bait object can be used e.g. soldiers will be tempted to kick an empty beer can lying on the ground as they walk past it. However, the can (partially filled with sand to add weight) may be resting on top of an M5 pressure-release firing device screwed into a buried M26 grenade. Many purpose-built booby-trap firing devices exist such as the highly versatile M142 universal firing device (identical to the British L5A1 or Australian F1A1), or Yugoslavian UMNOP-1 which allow a variety of different ways of triggering explosives e.g. via trip wire (either pulling it or releasing the tension on it), direct pressure on an object (e.g. standing on it), or pressure release (lift/shift something) etc. Almost any item can be booby-trapped in some way. For example, booby trapping a flashlight is a classic tactic: a flashlight already contains most of the required components. First of all, the flashlight acts as bait, tempting the victim to pick it up. More importantly, it is easy to conceal a detonator, some explosives, and batteries inside the flashlight casing. A simple electrical circuit is connected to the on/off switch. When the victim attempts to turn the flashlight on to see if it works, the resulting explosion blows their hand or arm off and possibly blinds them. The only limits to the intricacy of booby-traps are the skill and inventiveness of the people placing them. For example, the "bait object" (e.g. a cash box in a corner of the room) which lures victims into the trap may not in fact be booby-trapped at all. However, the furniture which must be pushed away in order to get to the bait has a wire attached, with an M142 firing device connected to a 155mm artillery shell on the other end of it. A booby trap may be of any size. However, as a general rule the size of most explosive booby traps use between 250 g and 1 kg of explosive. Since most booby traps are rigged to detonate within a metre of the victim's body, this is adequate to kill or severely wound. the only abandoned houses left standing in a village, which may attract enemy soldiers seeking shelter. a door, drawer or cupboard inside a building that someone will open without thinking of what might be connected to it. If a door is locked, this makes people believe there could something valuable behind it so they are more likely to kick it open, with fatal results. vehicles abandoned by the roadside, perhaps with some kind of victim "bait" left on the back seat such as a suitcase or large cardboard box. natural choke-points, such as the only footbridge across a river, which people must use whether they want to or not. important strategic installations such as airfields, railway stations and harbour facilities, all of which the invading forces will want to occupy and use. anything of use or value that people would naturally want to possess or which makes them curious to see what is inside it, e.g. a crate of beer, a pistol, a flashlight, discarded army rucksack or even a picture torn out of a pornographic magazine. A booby trap does not necessarily incorporate explosives in its construction. Examples include the punji sticks mentioned above and deadfall traps which employ heavy objects set up to fall on and crush whoever disturbs the trigger mechanism. However, setting non-explosive booby traps is labour-intensive and time-consuming, they are harder to conceal and they are less likely to do serious damage. In contrast, booby traps containing explosives are much more destructive: they will either kill their victims or severely wound them. slow down troop movement as soldiers are forced to sweep areas to see if there are more booby traps. Booby traps are indiscriminate weapons. Like anti-personnel mines, they can harm civilians and other unsuspecting noncombatants (during and after the conflict) who are unaware of their presence. A type of booby-trap was referred to in an 1839 news story in The Times. During the Vietnam War, motorcycles were rigged with explosives by the National Liberation Front and abandoned. U.S. soldiers would be tempted to ride the motorcycle and thus trigger the explosives. In addition, NLF soldiers would rig rubber band grenades and place them in huts that US soldiers would likely burn. Another popular booby trap was the "Grenade in a Can", a grenade with the safety pin removed in a container and a string attached, sometimes with the grenade's fuse mechanism modified to give a much shorter delay than the four to seven seconds typical with grenade fuses. The NLF soldiers primarily used these on doors and attached them to tripwires on jungle paths. The CIA and Green Berets countered by booby-trapping the enemy's ammunition supplies, in an operation code-named "Project Eldest Son." The propellant in a rifle or machine-gun cartridge was replaced with high explosive. Upon being fired, the sabotaged round would destroy the gun and kill or injure the shooter. Mortar shells were similarly rigged to explode when dropped down the tube, instead of launching properly. This ammunition was then carefully re-packed to eliminate any evidence of tampering, and planted in enemy munitions dumps by covert insertion teams. A sabotaged round might also be planted in a rifle magazine or machine-gun belt and left on the body of a dead NLF soldier, in anticipation that the deceased's ammo would be picked up and used by his comrades. No more than one sabotaged round would be planted in any case, magazine, or belt of ammunition, to reduce the chances of the enemy finding it no matter how diligently they inspected their supplies. False rumors and forged documents were circulated to make it appear that the Communist Chinese were supplying the NLF with defective weapons and ammunition. 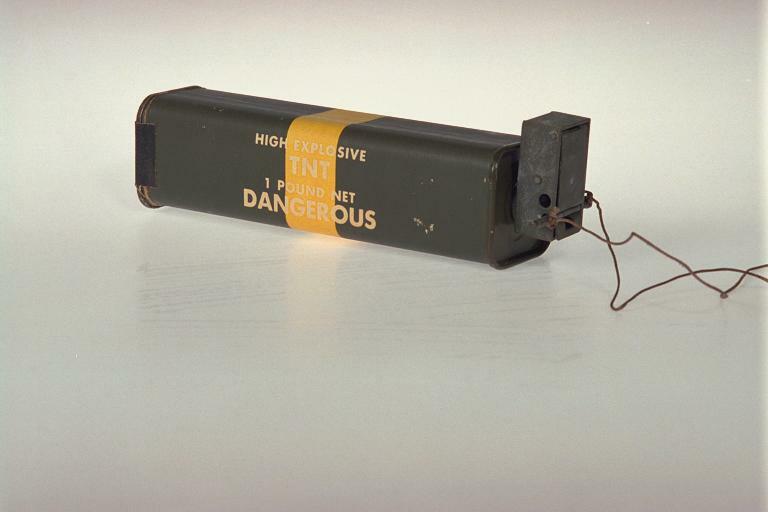 During the "Troubles" in Northern Ireland, booby trap bombs were often used by the Provisional Irish Republican Army (IRA) and the Irish National Liberation Army (INLA) to kill British Army soldiers and Royal Ulster Constabulary officers. A common method was attaching the bomb to a vehicle so that starting or driving it would detonate the explosive. According to the Sutton Index of Deaths, 180 deaths during the Troubles were the result of booby trap bombs, the vast majority of them laid by the Provisional IRA. During the Al-Aqsa Intifada, some Arab-Palestinian groups made wide use of booby traps. The largest use of booby traps (between 2000–2005, the period of the Intifada) was in the Battle of Jenin during Operation Defensive Shield where a large number (1000-2000 according to Palestinian militant captured in Jenin during the battle ) of explosive devices were planted by insurgents. Booby traps had been laid in the streets of both the camp and the town, ready to be triggered if a foot snagged a tripwire or a vehicle rolled over a mine. Some of the bombs were huge, containing as much as 250 lb (110 kg) of explosives. To counter the booby traps, anti-tank and anti-personnel mines the IDF sent armored D9 bulldozers to clear the area out of any explosive device and booby trap planted. The IDF D9 bulldozers were heavily armored and thus did not sustain any damage from the explosions, which were triggered by them as they pushed forwards. Eventually, a dozen D9 bulldozers went into action, razing the center of the refugee camp and forcing the Palestinian militants inside to surrender. As a rule, most purpose-made military booby-trap firing devices contain some form of spring-loaded firing pin designed to strike a percussion cap connected to a detonator at one end. The detonator is inserted into an explosive charge e.g. C4 or a block of TNT. Triggering the booby-trap (e.g. by pulling on a trip-wire) releases the cocked firing pin which flips forward to strike the percussion cap, firing both it and the attached detonator. The resulting shock-wave from the detonator sets off the main explosive charge. Booby traps can also be applied as defensive weapons against unwelcome guests or against non-military trespassers, and some people set up traps in their homes to keep people from entering. Laws vary: the creator of the trap may be immune from prosecution since the victim is trespassing, or the home owner may be held liable for injuries caused to the trespasser. Booby traps can also be a manner in which one can catch a criminal vandalizing items or areas in which there was no permission given to alter. Instead of being used to kill, maim or injure people, booby traps can also be used for entertainment. Practical joke booby traps are typically disguised as everyday items such as cigars or packets of chewing gum, nuts or other snack items. When the victims attempts to use the item, the trap is triggered. Two of the best known examples of this are the exploding cigar and dribble glass; others include the Snake Nut Can and shocking gum. Booby traps can also be constructed out of household or workplace items and be triggered when the victim performs a common action. Examples of this include loosening the bolts in a chair so that it collapses when sat upon, or placing a bucket of water on top of a partly open door so that when the door is fully opened, the bucket tips onto the victim. A variant is the water bucket which when "thrown" at the target, is full of confetti. ^ "Bobo English Spanish Translation | Traductor ingles español". Spanishdict.com. Retrieved 2011-09-15. ^ "Blue-Footed Boobies, Blue-Footed Booby Pictures, Blue-Footed Booby Facts - National Geographic". Animals.nationalgeographic.com. Retrieved 2011-09-15. ^ A voyage to the South sea ... - Google Books. Books.google.com. Retrieved 2011-09-15. ^ a b "Online Etymology Dictionary". Etymonline.com. Retrieved 2011-09-15. ^ HM Government (1941). Military Training Pamphlet No 36 Part IV: Booby Traps. War Office. ^ "INERT PRODUCTS, LLC., Inert Explosive Training Products & Counter IED Training Aids - Inert, 122mm Replica Artillery Shell IED With Pressure Plate (Hacksaw Blades)". Inertproducts.com. Retrieved 2011-09-15. ^ John Pike. "FM 20-32 CHAPTER 13". Retrieved 23 February 2015. ^ "Tactical and Materiel Innovations". History.army.mil. Retrieved 2011-09-15. ^ LEXPEV. "Release firing device M5". Lexpev.nl. Retrieved 2009-11-03. ^ John Pike (2005-04-27). "FM 20-32 APPENDIX A". Globalsecurity.org. Retrieved 2009-11-03. ^ John Pike (2005-04-27). "FM 20-32 CHAPTER 1". Globalsecurity.org. Retrieved 2009-11-03. ^ "M142_Firing_Device_Dem_Comb" (PDF). Retrieved 2009-11-03. ^ LEXPEV. "M142 MULTIPURPOSE FIRING DEVICE". Lexpev.nl. Retrieved 2011-09-15. ^ LEXPEV. "Firing device demolition combination L5A1". Retrieved 23 February 2015. ^ LEXPEV. "F1A1 Firing Device". Retrieved 23 February 2015. ^ LEXPEV. "UMNOP-1". Retrieved 23 February 2015. ^ "British Demolition Equipment". Retrieved 23 February 2015. ^ LEXPEV. "UMNOP-1". Lexpev.nl. Retrieved 2011-09-15. ^ LEXPEV. "Switch, No6 Release Mk1". Lexpev.nl. Retrieved 2011-09-15. ^ LEXPEV. "Switch, No3 Release Mk1". Lexpev.nl. Retrieved 2011-09-15. ^ LEXPEV. "Release firing device M5". Lexpev.nl. Retrieved 2011-09-15. ^ "Soldier blinded by IRA loses £55,000 from payout - because he had already lost sight in one eye | Mail Online". London: Dailymail.co.uk. 2008-03-12. Retrieved 2009-11-03. ^ "ATF puts up $10,000 reward for info on Phoenix IED attacker". Retrieved 23 February 2015. ^ "Body of Constable Ronan Kerr is taken to family home". BBC News. 2011-04-04. ^ "UK | England | Hereford/Worcs | Amputee para regains independence". BBC News. 2009-06-23. Retrieved 2009-11-03. ^ Newton, Tom (2008-10-01). "Brave pair who lost limbs in war will aid wounded comrades | The Sun |News|Campaigns|Our Boys". London: The Sun. Retrieved 2009-11-03. ^ "In Its Own Words". Hrw.org. Retrieved 2011-09-15. ^ "Project Eldest Son". Jcs-group.com. Archived from the original on 2011-09-27. Retrieved 2011-09-15. ^ "CAIN: Sutton Index of Deaths - menu page". Retrieved 23 February 2015. ^ "Palestinian fighter describes 'hard fight' in Jenin". CNN.com. April 23, 2002. Archived from the original on January 9, 2008. Retrieved September 18, 2008. ^ Rees, Matt. "Inside the Battle of Jenin". Time Magazine. Archived from the original on December 7, 2008. Retrieved September 19, 2008. ^ "Microsoft Internet Safety and Security Center". Microsoft. Retrieved 23 February 2015. ^ "Behind Friendly Lines". Retrieved 23 February 2015. The Straight Dope: What's the origin of "booby trap"? This page was last edited on 25 March 2019, at 00:27 (UTC).